Hi friends! I hope you are all having a great weekend! I am b usy busy busy with deadlines. Hopefully, I'll have some time to relax today. I have been doing a fair amount of creating though, so that's good. Today, I have my card for the current All Things Unity challenge to share with you. The challenge is From the Hearth, using food themed stamps. You can see the challenge details HERE. Here's my card, I decided to make a Thanksgiving card with a combo of Unity and Ippity Stamps since this is All Things UNITY, after all. The pumpkin is from Ippity's That's Creepy. 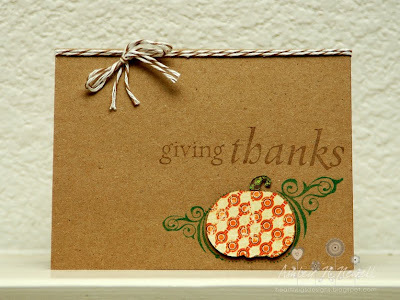 I thought that the flourishes were actually lovely for a Thanksgiving card. The sentiment is from Unity's Simple Blessings. The patterned paper is Bo Bonny Vicki B. The twine is Brown Sugar Divine Twine. This is so cute. I just love how the pumpkin pops off the card. Thanks for playing along with us at ATU!